Back in 2014, I wrote a post titled “Five ways to build a $100 million business”. If you haven’t seen it yet, the central idea of the article was to look at how many customers you need, for a given ARPA, to get to $100 million in annual revenue and what this might mean for your sales and marketing strategy. That post went kind of viral, which led us to create a follow-up piece, an infographic, a poster (which you can order here), and a PlayPlay video. What did I learn from that experience? First, if you want to write a killer blog post, it helps if you take a difficult question and simplify it drastically, give it a catchy headline, and add pictures of cute animals. 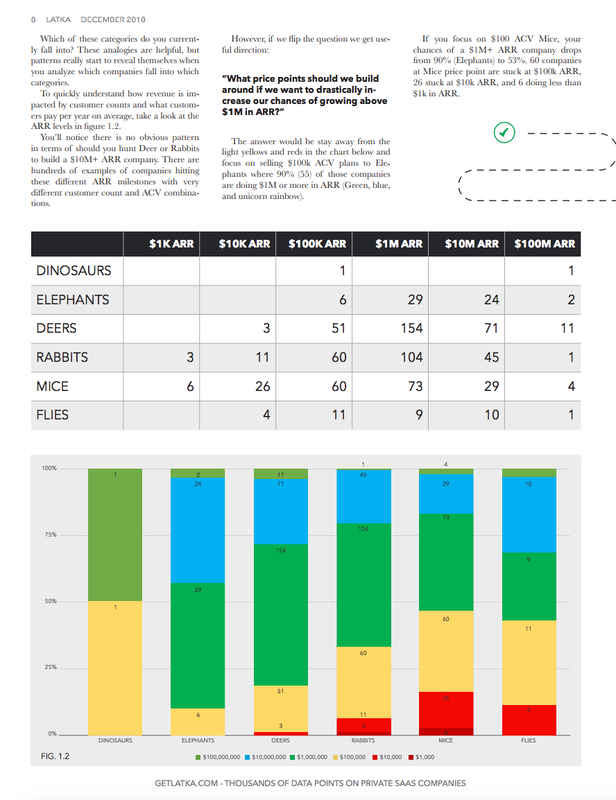 ;-) More importantly, though, using my five little animals as a simple framework has helped me challenge (and hopefully occasionally provide sound advice on) the scaling strategies of numerous startups over the last couple of years. In my original post, I spoke about five ways to build a $100 million Internet company. The post wasn’t specifically about B2B SaaS companies, which is why two of the five ways dealt with customers with an ARPA of $10 and $100, respectively. I will keep the $100 ARPA customers (AKA mice) for now, but today it’s time to say goodbye to the $10 ARPA flies. Bye-bye, dear fly, you’ll always have a special place in my heart. Thank you for adorning so many slides and posters – maybe someone will resurrect you for a consumer-focused version of this framework. Five years ago, I thought it would make sense to use a $100,000 ARPA elephant as the largest animal on the chart. The main reason is that I grew up as a consumer software and consumer Internet founder, and even though I had already spent about five years as a SaaS investor when I wrote the post, my experience was heavily skewed towards SMB SaaS. 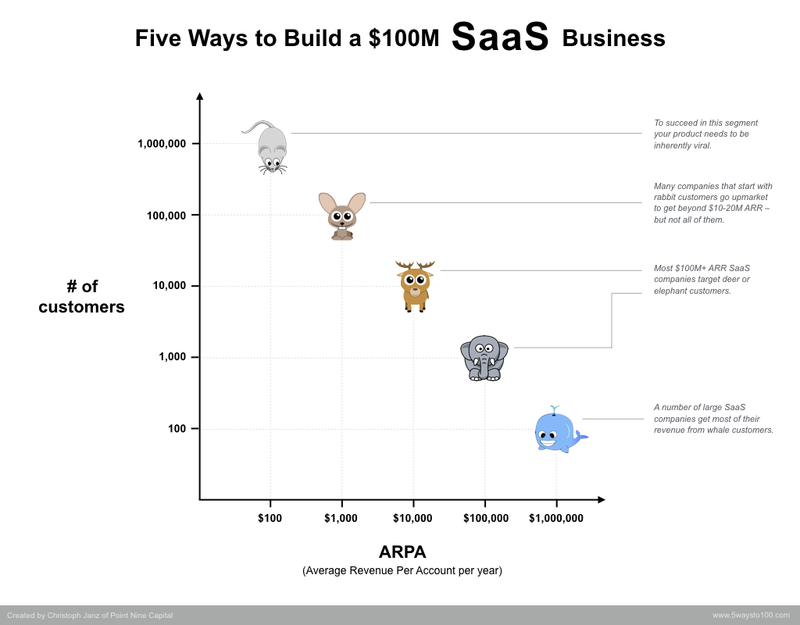 I did include two larger animals in a followup post, but meanwhile, I think that the $1,000,000 ARPA whale deserves a place as one of the five prime SaaS animals. While there are only a few SaaS companies with an ARPA of around $500,000 (not quite a whale yet, but definitely much larger than an elephant) across the entire customer base (Veeva, Workday, Demandware, Opower,...), there are quite a few SaaS companies with a significant whale customer segment. Most public SaaS companies, unfortunately, don’t report any data broken down by different customer segments, but it’s pretty safe to assume that Salesforce, Box, Zuora, and a number of other companies derive a significant portion of their revenue from whale customers. This is a smaller, somewhat technical change. The original chart showed the number of customers on the x-axis and the ARPA on the y-axis. Since it’s more customary to use the x-axis for the dependent variable (and as I think it makes more sense to think of ARPA as the dependent variable), I have switched the axes. I had made that change in the poster already and have now updated the chart here as well. One thing I’ve learned over time is that just because there are five ways to build a $100 million business, it doesn’t mean that those five ways aren’t equally promising. To quote the pigs in George Orwell’s “Animal Farm” (one of the very few books that we had to read at school that I liked): All animals are equal, but some animals are more equal than others. Let’s take a step back. The key take-away of my “5 animals framework” is very simple: if you want to get to $100 million in annual revenue you’ll have to find customer acquisition channels that are highly scalable and profitable. Otherwise, you’ll never get to the number of customers that you need at your given ARPA. The problem is that most customer acquisition channels are either scalable orprofitable but not both at the same time (which is why early CAC/LTV metrics can be so misleading, more about that here). Now, it seems like in some ARPA regions it’s easier to scale profitably than in others. 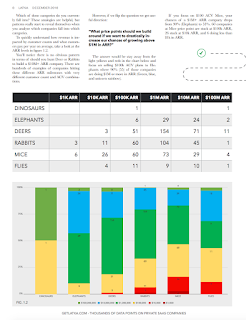 This is certainly what we’ve seen in our portfolio: Several of our SaaS portfolio companies successfully went upmarket – oftentimes from rabbits to deer or even elephants – when they saw that they would hit a growth ceiling in their existing segment. One of the underlying reasons is that in order to get very large, you have to get your churn rate close to zero (or better yet, achieve negative churn), which is usually not possible if you’re selling only to SMBs; the other reason is that outbound sales doesn’t work if your ARPA isn’t large enough, which sort of limits your addressable market to companies that are more or less pro-actively looking for a solution like yours. If you take a look at this analysis by Sammy Abdullah of Blossom Street Ventures (a VC with the tagline “We’re the anti-VC”, by the way) you’ll see that although Sammy points out that most SaaS companies don’t have an ACV of $50k or more, the vast majority of the 61 publicly traded SaaS companies from his list are deer or elephant hunters. Only 15 of the companies from the list had an ACV of less than $5k at the time of their IPO, and for some of them, the average is misleading because a large part of their revenue comes from customers with a much higher ACV (e.g. Zendesk, Box). A recent analysis of private SaaS companies by Nathan Latka suggested the same. In his analysis, Nathan looked at 369 companies at around $1M in ARR. 186 of those (50%) are focused on rabbits or smaller animals (he really used those animal analogies). Of the 20 companies with $100M in ARR that Nathan looked at, on the other hand, only 6 (30%) are focused on low ACVs. If you are a successful rabbit-hunting SaaS company and you think you can keep growing in your current segment, these numbers shouldn’t discourage you, though. First, especially the numbers from private companies need to be taken with a grain of salt. 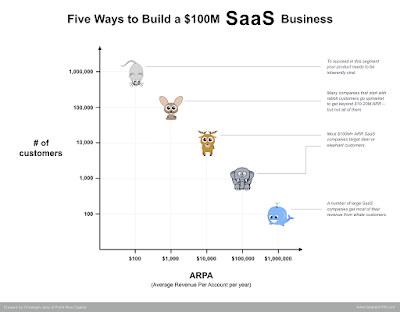 And second, even if there is a statistically significant clustering of mid-market and enterprise SaaS companies at the $100M ARR mark, the data also shows that it’s possible to get there with a low ARPA!